2012 Upper Deck Soccer kicks off another season of MLS action. Collectors will find a strong checklist of stars and up-and-comers, including the first cards of Los Angeles Galaxy standout Robbie Keane. Every hobby box comes with five hits: one autograph and four game-used memorabilia cards. At least one of the gamers is either a multi-swatch card or has a premium swatch. No matter the sport, great photography has always been a centerpiece of Upper Deck's flagship sets. 2012 Upper Deck Soccer is no different. The full-bleed design offers edge-to-edge action shots and little else. The swooping nameplates have all the essentials: player name, team logo, position and jersey number. The 200-card base set breaks down into three subsets: 165 regular player cards, 15 MLS Debuts and 20 MLS SuperDraft cards that highlight newly selected players. With five hits in every hobby box, collectors have plenty to chase. For the autograph hunt, MLS Marks, MLS Marks Throwbacks and MLS Dual Marks are all numbered to 50 or less. Recent draft selections are the focus of SuperDraft Signatures, the only autographs in the release that don't have serial numbers. Basic game-used memorabilia cards in 2012 Upper Deck Soccer are divided between MLS Materials, MLS Throwback Materials, MLS Teammates Dual Materials, and MLS Teammates Throwbacks Dual Memorabilia. Several serial-numbered game-used cards exist including cards with three or four premium swatches. 2012 Upper Deck Soccer also has Update Trade Card redemptions. Numbered to 50 or less. Dual-signed cards, numbered to 50 or less. Premium Series - #/50 or less. MLS Throwback Materials Premium Series - #/25 or less. 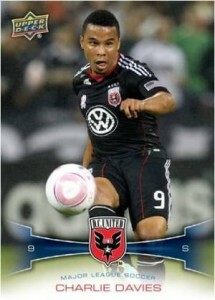 MLS Teammates Dual Memorabilia Premium Series - #/50 or less. MLS Teammates Throwbacks Dual Memorabilia Premium Series - #/50 or less. Numbered to 75 or less. 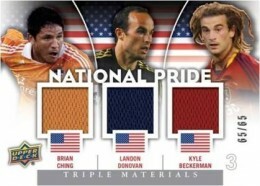 MLS National Pride Triple Memorabilia Premium Series - #/50 or less. MLS National Pride Throwbacks Triple Memorabilia Premium Series - #/50 or less. 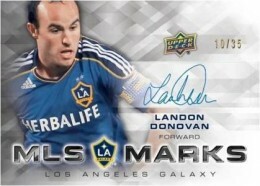 MLS Superstars Quad Memorabilia Premium Series - #/25 or less. MLS Superstars Throwback Quad Memorabilia Premium Series - #/25 or less. How can they do this set without adding a USWNT WWC add in? They did it right in 2000. Upper Deck has missed the mark on soccer cards like a blind sharp shooter. The samples show Charlie Davis who’s loan was not extended as far back as January. Panini will be making a set that includes US National Team players. Collect that.These MLS have not history, not stats just fluff. Chuck (ID 42590) � Tracy Hackler from Panini did say in an interview on Cardboard Connection Radio last Friday that while they are including members of the US Women’s Team in their upcoming Americana set, they currently do not have a deal in place for cards of the men’s team. 2012 Upper Deck Goodwin Champions Memorabilia Jersey #M-CD Clint Dempsey ! !